Date posted: July 4, 2014 by: JasonDarkX2 Category: Gaming Reviews 2 comments. Finally something for them enforcers, Payday 2 Gage shotgun weapon pack further expands the Payday 2 arsenals, for $4.99US gets you access to three new shotguns, 4 melee weapons, 3 new ammo types exclusives to shotguns, monkey masks customize set. Surely at face value it’s simply just another weapon pack. But is it well worth the full $5.00? Is the question on everyone’s mind? Well to start Shotguns will be shotguns, nothing but packing a punch close range, medium range. To start the M1014 stock is really garbage primary shotgun, when fully upgrade with mods it’s still meh, with its fast fire rate and low capacity you’ll find yourself having to constantly reload in the midst of an assault, slapping a silencer on the M1014 would render it weaker than a silenced pistol. Next off is the Raven another primary slot. The raven is a very rounded shot gun in the pack, with a high damage, paired high capacity and ok fire rate makes for a deadly primary. The raven equipped with AP slug ammo type slices through armored cops like cheese with one shot to the head and two for bodies. Lastly we have the street sweeper which is a secondary that is a good competitor to the locomotive. With a fast fire rate and triple the magazine size of 12 than the M1014. Making the street sweeper a good contender for loud mission and/or if you’re taking a saw as a primary. 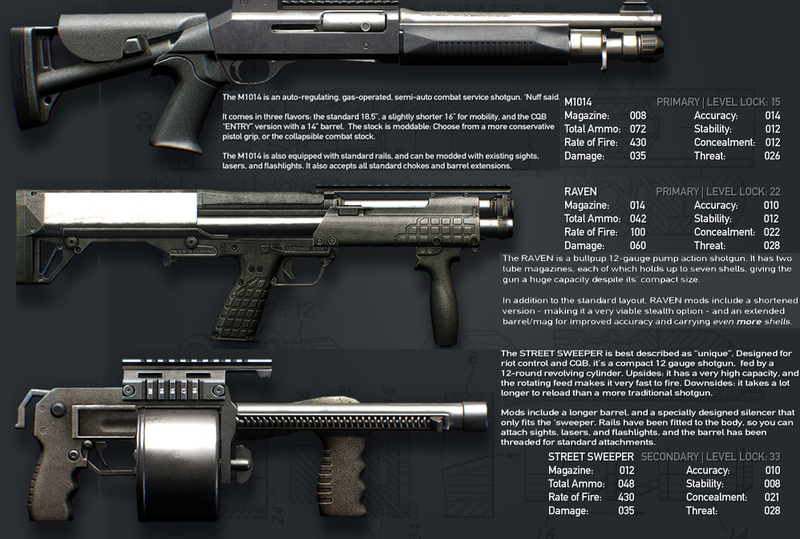 Equipping the 000 Buck shot ammunition with the street sweeper provide enough impact and damage to make enemies fly. But the Street sweeper truly shines when HE Rounds are equipped turning it into a grenade launcher blasting always cops, becoming the perfect choice for loud and carnage heist. Wait there's more, the four almost forgettable melee weapons included in this pack. first one being the survival tomahawk, now you can chop people up like in Assassin creed 3, while robbing your favorite places. the Tomahawk uses a hack animation for copping enemies, more animation would have been nice. It's fun to use if your a tomahawk person, the machete is more like a visual mod of a regular knife from gage pack 2. The baton is an interesting one, it seems to be nonlethal, with a couple whacks at someone will surely put them done, seriously not a practical melee weapon on loud missions. But beating someone down or hitting the civilians with what seems like a stick is somewhat satisfying. But the shovel melee weapon is a score, the shovel is surely a classic criminal weapon now in Payday 2 makes it almost perfect couple lol, the sound it makes it makes is hilarious and delightful can't help running around with the shovel yelling "Bonk" after each kill. Overall good set of melee weapons adding a bit unique ones to the spice things up a bit in Payday 2, the shovel would make a perfect payday 2 gift lol. 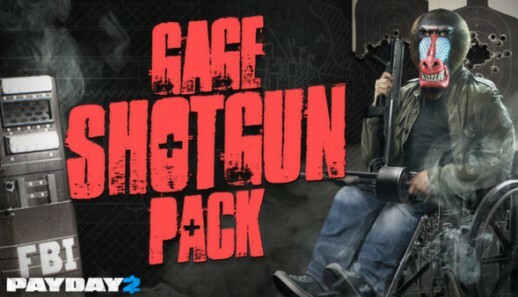 In terms of customization a Monkey set is bundled with the Gage shotgun pack. Bringing 4 amazingly viciously look Monkey faces that you into a heist so get your bad touch on and go steal some bananas. The materials and patterns are on the meh scale, while you can pull off some cool combination with the red, green, yellow materials. All cosmetic and weapon mods are reusable and unlocked through achievements that are becoming more of a chore to earn rather than actual achievements in my opinion. I personally wasn't too impressed with the material and pattern included in this pack. But hey when it comes down to cosmetic game content is about personal preference, nice inclusion but not necessary anything ground breaking content. Overall Payday 2: Gage shotgun pack is certainly the perfect close quarter weapon pack for those that just starting out or want to expand their shotguns and melee weapon class on Payday 2, which was lacking in shot guns to begin with. Otherwise if you have already purchased the previous three weapon pack there isn't much worth wild having in the primary weapon category. Unless you are trying to keep up on obtaining 100% completion in Payday 2 or a big fan of monkeys and shot guns then this pack worth considering. Otherwise holding out for steam sale for $0.99 on the shot gun pack is probably the bang for your buck. Final verdict for this pack is 7.3/10. Add 3 new shot guns. Monkey mask set is impressive. Reusable weapon mods, mask patterns, and mask materials. Explosives, HE rounds are fun. Achievements are more of a chore to do than fun. Grinding for weapon mods is required.